The project aims to strengthen professional networks by linking academic expertise on action research and good practice in the language classroom. The goal is to contribute to the improvement of language education by giving teachers across Europe better access to action research and new perspectives on languages methodologies. Teachers who carry out action research in the classroom confirm that it leads to a better understanding of teaching methodologies and of the different ways in which learners learn. Action research enables teachers to reflect on their practice and to propose and test innovations. Moreover, undertaking action research within a community of practice with direct links to academic research provides a sound base for applying the results and helps develop professional self-confidence. design action research tools which not only help improve the quality of teaching and learning but also help foster dialogues between teachers, heads of departments, administrators & teacher educators. demonstrate how research can feed into practice and practice into research. show why undertaking action research is beneficial to teachers and learners, through a series of success stories in different languages. create European models for peer learning activities which can be also be implemented at national/school level. This project is about making techniques for action research widely available through the establishment of a community of practice, bringing together newly qualified teachers, experienced teachers, teacher trainers and university researchers. Action research communities for language teachers will connect action research and a culture of quality within an international network and initiate and support dialogues between all concerned in the field of languages education. Action research communities for language teachers will use languages as a base for working with other disciplines, demonstrating that language learning does not only take place in the language classroom. Language learning is an integral element of every subject, every professional field and every learning situation. The ideas will be further disseminated through presentations at general action research conferences. Teachers are at the heart of the quality process in the language learning classroom. This project will support teachers in European classrooms in using action research as an essential tool for the development of reflective classroom practice highlighting ways in which teachers can enhance their self-confidence and professionalism. This in turn will improve the quality of their teaching and at the same time strengthen teacher confidence. Online platform with a bank of resources, including key documentation, and didactic materials. Positive impact on language education in classrooms through professional networks and peer support. The European Centre for Modern Languages project “Action research communities for language teachers” (ARC) has supported teachers in European classrooms in using action research as an essential tool for the development of reflective classroom practice - highlighting ways in which teachers can enhance their self-confidence and professionalism. The webinar (featured below) which took place on 25 January 2019 provides an insight into the experiences gathered over the 3 years of the project (2016-18) and the results achieved. 13 items found for "Show all items"
Oct 2016 Workshop on "Action Research to enhance intercultural learning in the German classroom"/"Aktionsforschung zum interkulturellen Lernen im Deutschunterricht"
Expert mission in the framework of the project on “Action research communities for language teachers"
Feb 2016 "Action research communities for language teachers"
This issue is devoted to the Call for proposals for the ECML 2020-2023 programme "Inspiring innovation in language education: changing contexts, evolving competences" and the ECML webinar on "Action research communities for language teachers" which will be held on 25 January, 16:00-17:30. At the beginning of September, Christine Lechner and Marianne Jacquin had the opportunity to present the ARC project as the opening keynote at the first international Conference held by the Association en didactique des langues étrangères en Suisse (ADLES) in Lausanne. The conference brought together university lecturers in language teacher education from Switzerland and Germany and local teachers from different school levels. The thematic range of work presented in workshops was extremely broad. The opportunity to open the conference with a talk on action research meant that we were able to demonstrate to a large audience how action research can contribute to the enhancement of language teaching, to show how action research functions in practice both at university and school level and to give insights into the work of the ARC project. Conference programme "Foreign language learning for all - Methodological and didactical perspectives and question"
During the first half of 2018 the ARC-Team have had different opportunities to disseminate and discuss the project internationally. In January Marianne Jacquin, Christine Lechner and Renata Zanin held a presentation at the 6th CARN DACH (Collaborated Action Research Network in German-speaking countries) Symposium in Bielefeld. The main focus of this presentation was to demonstrate to an action research community how language teachers in different settings across the ECML countries can take first steps towards action research together. We presented some of the projects developed by participants of the ARC Workshop in November 2016 showing successes and challenges. It was the challenges that have led the project team to the development of the tools to “get teachers” into action research. The next CARN DACH meeting is to be held in Innsbruck in January 2019. Participants were lecturers and students at the HKIED, well informed about Lesson and Learning study approaches but less acquainted with further European action research practices. The talk focussed on the role and implications of action research at schools, in initial teacher education and Continuing Professional Development (CPD) in Europe and specifically on the ARC project showing examples from network participants and also the project tools as being currently developed. The audience were lecturers and students from the University of Tartu, Narva College and language teachers of schools, as well as lecturers from other European Universities. They all showed great interest in the ARC-pre-spiral and in the project as a whole. In June Angela Gallagher-Brett presented on ARC at the Innovative Language Learning and Teaching Conference at the University of Liverpool (InnoConf 18 book of abstracts). This presentation focused on the importance of collaborative action research for language teacher empowerment and development. Angela demonstrated examples of projects developed by ARC participants and discussed the challenges experienced as well as the successes. She also explained the tools under development and highlighted the Action Research Spiral. The audience were higher education language lecturers and tutors from UK universities who expressed considerable interest in the project tools and there has already been follow-up from the University of Liverpool where an action research training day for staff is now being planned. The ARC team held a workshop in Reykjavík for Upper Secondary teachers of Danish, English, French, German, Norwegian and Icelandic as an L2 on 7-8 June 2018. The workshop was organised by the Icelandic partner, Brynhildur Anna Ragnarsdottír, and the providers were Anita Konrad, Christine Lechner and Melanie Steiner from the Pedagogical University Tirol, Austria, and Tita Mihiau from the Centrul pentru formarea Continua in Limba Germana in Sibiu/Hermannstadt, Romania. The workshop was furthermore supported by local speakers, Dr. Hafdís Ingvarsdóttir and Hulda Karen Daníelsdóttír. The aim was to deliver a worthwhile workshop on action research leading teachers to first action research steps whilst focussing on lesson planning on a specific theme. The theme chosen in accordance with dynamic CEFR developments was intercultural learning. Thus, besides an introduction to action research and information about the ARC project, there was an open session showing exemplary didactic materials on intercultural themes embedded in language learning. During the final part of the workshop, participants worked on planning teaching units focussing on intercultural learning working in groups whereby some grouped according to the languages they teach and others collaborated across languages. As a second step, participants planned a mini-action research project corresponding to the first stage of the ARC spiral. The ARC Network Meeting was held at the European Centre for Modern Languages (ECML) on 3-4 May 2018. The event was co-ordinated by team members Angela Gallagher-Brett, Christine Lechner, Tita Mihaiu, Brynhildur Ragnarsdóttir, Anita Konrad, Marianne Jacquin and Renata Zanin and attended by 14 network members. The programme was designed around three cornerstones: presentations of action research projects developed over the past eighteen months by members of the ARC Network; input on activities around language learning and action research; discussions leading to tool development. At the heart of the event were the network projects showing up how action research leads to expedient steps in the classroom through reflection, and these projects are to be published on the project homepage by the end of the year. Gunther Abuja from the Austrian Language Competence Centre spoke about the activities of the centre and the co-operation with the ECML; Franz Rauch from the Institute of Teaching and School Development at the University of Klagenfurt held a talk on the state-of-the-art of action research in Austria. Jim Murphy from the Centre for Distant Learning and Innovation (CDLI) in Canada spoke via skype on support for endangered languages. The project team were extremely happy with the very constructive contributions to the tool development. Symposium celebrating the 10th anniversary of the Austrian Society for Languages Didactics: presentation of the project "Action research communities for language teachers"
On the 19 May 2017 Christine Lechner and Renata Scaratti-Zanin had the opportunity to attend the Symposium to celebrate the 10th anniversary of the Austrian Society for Languages Didactics and to present the ARC project ("Action research communities for language teachers") there. The lively and very intensive symposium hosted by the University of Vienna was attended by over 80 researchers, teachers and teacher educators as well as representatives from educational authorities and publishing houses from Austria, Germany, Italy and Hungary. The long abstract (*) on the ARC project (pp. 60-64) is included in the conference proceedings and describes the project framework, steps taken so far as well as the results from the workshop projects and ongoing developments. The third ARC team meeting took place on the 6th and 7th of April, 2017. The aims of the meeting were to consolidate the work of the first year and to plan for the second part of the project. The meeting provided the opportunity to discuss the results of the workshop held at the beginning of November 2016 and especially to look at the evolving Action Research projects planned there. We were extremely pleased that ten project reports have now been submitted and that the majority of the participants are still involved. A summary of the projects is soon to be published on the project homepage. From the results of the workshop we were able to move on to the design of action research tools, which will be trialed over the next few months. At the network meeting to be held on the 3rd and 4th of May, 2018 this work will be presented and 14 participants of the workshop will be invited back to the network meeting to present the results of their ongoing action research. The ECML project entitled “Action Research Communities for language teachers” aims to make techniques for action research widely available to language teachers across Europe by establishing a community of practice which brings together newly qualified and experienced teachers with teacher educators and university researchers. The project will strengthen professional language teaching networks by forging links between academic expertise on action research and good practice in language classrooms. Language teachers will be able to benefit from improved access to action research and to a diverse range of perspectives on teaching methodologies. In addition, this project will provide opportunities for language teachers to reflect on practice and to propose and test innovations while working collaboratively within a community of practice. The project has just completed an exciting and successful first year, which began with an initial planning meeting of the project team in Graz in February 2016. 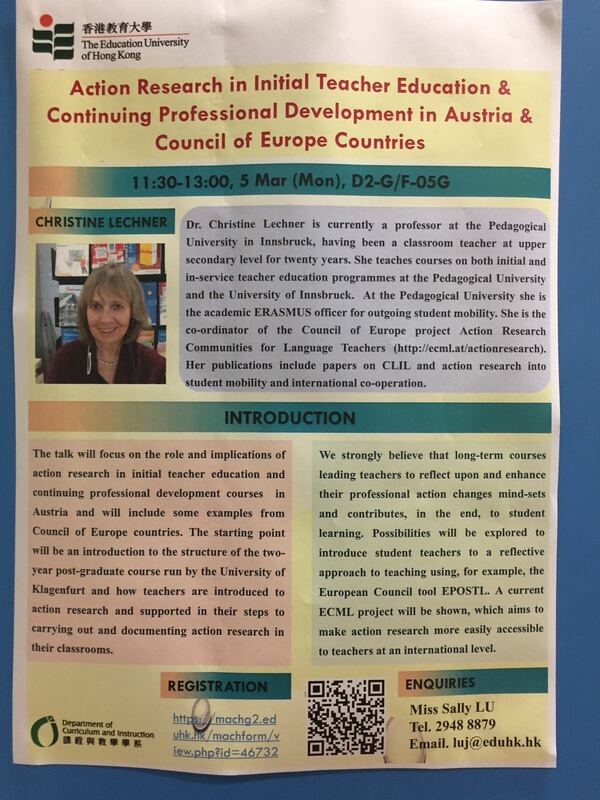 This was followed by the first project workshop at the Pedagogical University Tirol in Innsbruck during the International Week in April 2016 where broad-ranging discussions on quality and enhancement in teaching at tertiary level across Europe took place. The workshop was held in conjunction with the coordinator of “Towards a Common Framework of Reference for Language teachers”. We then organised an action research workshop for German teachers in Sibiu/Hermannstadt (Romania) in October 2016 which introduced the participating teachers to action research tools and provided them with the opportunity to plan and develop collaborative action research projects to be carried out in their own classrooms. The teachers are currently trialling the lessons and writing reports on the action research process. Finally, a workshop for teachers and teacher trainers/educators from across Europe was held in Graz in November 2016. Here participants shared inspiring stories and examples from their own teaching, reflected on action research approaches in different European contexts and also gained an insight from a Canadian expert into the vital contribution of distance and online language teaching in providing access to languages for rural communities. Participants subsequently identified their own action research interests and formulated collaborative group proposals for a set of pilot classroom projects. Groups are responsible for reporting on their projects in March 2017. The workshop was greatly enjoyed and we look forward to seeing and disseminating the outcomes of this work. It is already clear that an impressive level of activity is underway and that the collaborative approach is benefitting those teachers who are relative newcomers to action research. The project team will now move on to exploring and developing synergies and links with other ECML projects and will be producing a set of guidelines for action research networking strategies and formats for training courses to improve classroom practice by linking quality strategies to practical action research approaches. Ultimately, project outcomes will include the production of action research tools which help to improve the quality of language teaching and foster dialogue between teachers in different sectors and evidence which shows the reciprocal relationship between practice and research. We also hope to demonstrate the benefits of action research to teachers and learners by creating a set of success stories in different languages and to create European models for peer learning activities which can be implemented at school/national level. Das Projekt „Aktionsforschungsnetzwerke für SprachenlehrerInnen“ setzt sich als Ziel, Techniken der Aktionsforschung für SprachlehrerInnen in ganz Europa zugänglich zu machen. In diesem Sinn soll sowohl JunglehrerInnen als auch erfahrenen LehrerInnen und FortbildnerInnen die Möglichkeit zum praktischen Austausch geboten werden. Das Projekt möchte die existierenden Sprachunterrichtsnetzwerke stärken, indem es Verbindungen zwischen akademischem Fachwissen über Aktionsforschung und bewährter Praxis im Sprachunterricht herstellt. SprachlehrerInnen können von einem verbesserten Zugang zu Aktionsforschung und einem breiten Spektrum an Lehrmethoden profitieren. Darüber hinaus bietet dieses Projekt durch die Vernetzung der SprachlehrerInnen die Möglichkeit, über die Praxis nachzudenken und Innovationen vorzuschlagen und zu testen. Zu diesem Zeitpunkt können wir über ein spannendes und erfolgreiches erstes Projektjahr berichten: Begonnen hat es mit der ersten Planungssitzung des Projektteams in Graz im Februar 2016, auf das im April der erste Projektworkshop im Rahmen der „International Week“ an der Pädagogischen Hochschule Tirol in Innsbruck folgte. Hier gab es breit gefächerte Diskussionen über die europaweite Qualität und Verbesserung des Unterrichts im tertiären Bereich. Der Workshop wurde in Zusammenarbeit mit dem Koordinator des EFSZ-Projektes „Towards a Common Framework of Reference for Language teachers“ gehalten. Als Nächstes haben wir einen Aktionsforschungsworkshop für LehrerInnen aus Sibiu/Rumänien im Oktober 2016 organsiert, der den teilnehmenden Lehrpersonen den Zugang zu Instrumenten der Aktionsforschung erschlossen hat und ihnen die Möglichkeit gab, kollaborative Aktionsforschungsprojekte für den Unterricht auszuarbeiten. Die LehrerInnen sind dabei, diese umzusetzen und ihre Berichte dazu zu verfassen. Schließlich fand im November in Graz ein Workshop für LehrerInnen und FortbildnerInnen aus ganz Europa statt. Hier hatten die TeilnehmerInnen die Möglichkeit, inspirierende Geschichten und Beispiele aus der eigenen Praxis auszutauschen und unterschiedliche Ansätze der Aktionsforschung aus verschiedenen europäischen Kontexten kennenzulernen. Ein kanadischer Experte vermittelte den TeilnehmerInnen einen Einblick in die Wichtigkeit des Online-Sprachenlernens in schwer erreichbaren, ländlichen Regionen. TeilnehmerInnen haben in der Folge Ihre eigenen Aktionsforschungsinteressen abgesteckt und Vorschläge für Gruppenarbeit für Pilotierungsprojekte für den Unterricht erarbeitet. Rückmeldungen aus den Gruppen werden für März 2017 erwartet. Der Workshop war für alle Beteiligten sehr bereichernd und wir freuen uns schon auf die Sichtung und Dissemination der Ergebnisse. Bereits jetzt zeigt sich, dass eine beachtliche Fülle von Aktivitäten in Gang gesetzt wurde. Der kollaborative Ansatz ist auf jeden Fall ein bedeutender Vorteil für jene LehrerInnen, die gerade erst begonnen haben, sich mit Aktionsforschung zu beschäftigen. Das Projektteam wird sich nun auf die Erforschung und Entwicklung von Kontakten und Synergien mit anderen EFSZ-Projekten konzentrieren und an einem Handbuch für netzwerkorientierte Strategien der Aktionsforschung arbeiten. Es werden Fortbildungsformate entwickelt werden, die zur Verbesserung der Unterrichtspraxis führen können und bei denen Qualitätsstrategien mit Ansätzen aus der Aktionsforschung verknüpft werden. Schließlich werden als Ergebnis des Projekts Instrumente für die Aktionsforschung geschaffen und veröffentlicht, die dazu beitragen, die Qualität des Sprachunterrichts zu verbessern, den Dialog zwischen LehrerInnen in verschiedenen Sektoren zu fördern und das Wechselspiel zwischen Praxis und Forschung zu verdeutlichen. Mit Hilfe einer Sammlung von erfolgreichen Projekten in verschiedenen Sprachen werden wir versuchen, die Vorteile von Aktionforschung für LehrerInnen und LernerInnen zu belegen und ein europäisches Modell für kollegiales Lernen zu entwickeln, das im Schulbereich oder auf nationaler Ebene eingesetzt werden kann. The ECML's e-newsletter provides up-to-date news about the ECML (events, projects, resources), its partners and other relevant sectors of the Council of Europe. It focuses on language education and national developments in the member states and beyond. The Action Research Communities for Language Teachers workshop was held at the ECML in Graz on the 10-11 November 2016 run by the ARC team - Christine Lechner, Angela Gallagher-Brett, Tita Mihaiu, Brynhildur Ragnarsdóttir, Renata Zanin & Jim Murphy. We were very pleased to welcome 31 participants from the ECML member states. The workshop was the first open event of the project and as such the aims were to open the project and invite participants to join us in developments. Discussions on action research as a way to enhance quality in education were opened through activities such as an analytic discourse, a dialogue sheet to initiate discussions about quality in education, an action-research city walk. There was input on action research in national contexts as well as on distance learning. The results of the workshop are mini-action research projects that are currently being trialled across the ECML member states with final reports expected for the Spring. We are very much looking forward to exciting mini-action research project results. Interesting completed projects will be published on the project website and the most successful presented at the Network Meeting to be held on 3-4 of May 2018. Der Workshop des Projektes „Aktionsforschungsnetzwerke für SprachenlehrerInnen“ fand von 10. bis 11. November 2016 statt und wurde vom ARC-Team (Christine Lechner, Angela Gallagher-Brett, Tita Mihaiu, Brynhildur Ragnarsdóttir, Renata Zanin und Jim Murphy) geleitet. Am Workshop haben 31 SprachenlehrerInnen aus den EFSZ-Mitgliedsstaaten teilgenommen. Der Workshop war die erste große Veranstaltung des Projekts und diente der Bekanntmachung der Projektideen. Die TeilnehmerInnen wurden eingeladen, uns in unserem Vorhaben zu unterstützen. Die Diskussion über Aktionsforschung als ein Weg zur Qualitätssicherung im Bildungswesen wurde angeregt durch Aktivitäten wie Analysegespräche, ein Dialogblatt als Hinführung zum Thema „Bildungsqualität“ oder ein Aktionsforschungs-Stadtspaziergang. Auf dem Programm standen Präsentationen zum Einsatz von Aktionsforschung in nationalen Kontexten und zu Formen des Sprachenlernens im Fernunterricht. Die Ergebnisse des Workshops sind Mini-Aktionsforschungs-Projekte, die nun in Kleingruppen in den EFSZ-Mitgliedsstaaten durchgeführt werden und für die im Frühling ein Endbericht seitens der TeilnehmerInnen zusammengestellt wird. Wir freuen uns sehr auf spannende Mini-Aktionforschungs-Ergebnisse. Interessante Mini-Projekte werden auf der Webseite des Projektes zugänglich sein und das erfolgreichste Projekt wird beim Netzwerktreffen am 3. und 4. Mai 2018 vorgestellt. Members of the Action Research Communities for language teachers ran a workshop for teachers of German in Hermannstadt/Sibiu from 20th to 22nd of October, 2016. The aim was to introduce teachers to an action research way of thinking, to understand the benefits of action research for the enhancement of their classroom practice. The content theme of the seminar was “Teaching about the culture of a target-country language in the language classroom: Austria”. The workshop opened with activities to exchange and compare knowledge, beliefs and opinions about Austria. The next stage was an analytic discourse based on posters made by the teachers to visualise a typical lesson on a cultural aspect in their German class. The first day was concluded by general information about the “Action Research Communities for language teachers” and also by showing what the European Centre for Modern Languages (ECML) can offer to teachers of languages. It was important to ask for the participant feedback on what they had found interesting on the first day and what their hopes were for the continuation. Clearly, the teachers were keen to get concrete input that they could use at school. We were very pleased that they had found the exchange and getting to know each other professionally at some depth through the analytic discourse useful. The second day opened with input on action research followed by an opportunity for the teachers to look at materials on Austria and approaches that they might use. They worked in groups moving from station to station. At the end of the second day, the teachers started to think about themes that they might work on and appropriate groups. The third day opened with input on Learning Study as a co-operative form of action research and on an activity to generate shared visions for lessons on aspects of culture. The participating teachers planned in groups to hold lessons in their own classrooms and to write a joint report following individual experiences. The plans were shared through short presentations showing intentions and expectations. We ended the workshop with a “crumple-paper” evaluation: “Lots of fun - using the methods presented will be worthwhile – we will carry on working together”. This workshop will be an excellent opportunity for 39 experts to open up this ECML project (2016-2019) for ideas on action research and to bring together action research initiatives as practised across 32 European countries. The event aims to provide incentives to continue with action research and to discover new paths together. Over two days, the participants will be working on generating mini-action research projects to be carried out over the next few months with the support of international colleagues. Envisaged project outputs: Guidelines for action research and for networking strategies towards quality enhancement in language teaching; a practical guide to action research for teachers and teacher educators; piloted models of trialled course units; a set of success stories in several languages; an online platform with a bank of resources. Action Research Communities for Language Teachers is a tremendous opportunity to bring together language teachers and teacher educators interested in developing their practice through action research. ARC will be a meeting point where action research experiences in the ECML member states can be exchanged, newer approaches discovered and paths opened. ARC takes inspiration from previous ECML projects on action research and quality and also action research cultures in different countries. The project will run from January 2016 until December 2018 and the team members are Christine Lechner (Pedagogical University Tirol, Austria), Angela Brett-Gallagher (University of Southampton, United Kingdom), Tita Mihiau (Pedagogical Institute, Hermannstadt, Romania) and Brynhildur Ragnarsdottir (University of Reyjavik, Iceland). The ARC workshop at the ECML will take place on 10-11 November 2016 for colleagues from ECML member states open to enhancing teaching practice through action research. The aim is to bring together experienced colleagues and those embarking upon a teaching career. Those interested are invited to take up contact with the ECML National Nominating Authority in their country so that they can be considered for participation in the corresponding project workshop. The first expert meeting was held at the end of February 2016. The participants were able to become better acquainted and to exchange on professional views on action research and look at action research practices in our national settings. Project activities began during the international week at the Pedagogical University Tirol during which an afternoon workshop was held in collaboration with the coordinator of the project “Towards a Common European Frameworkof Reference for language teachers” exchanging European views on quality in teacher education. On 20-22 October members of the project team will be working with German teachers in Hermannstadt on enhancing teaching “Intercultural Learning in the German classroom” through action research methodology.